Scary Little Girls is super excited to be taking part in an indulgent one-off 4-course chocolate, storytelling and musical odyssey in collaboration with Niko B Chocolates… Not to be missed, the specially created menu (complete with music and story pairings) is jaw-dropping and will not be repeated. 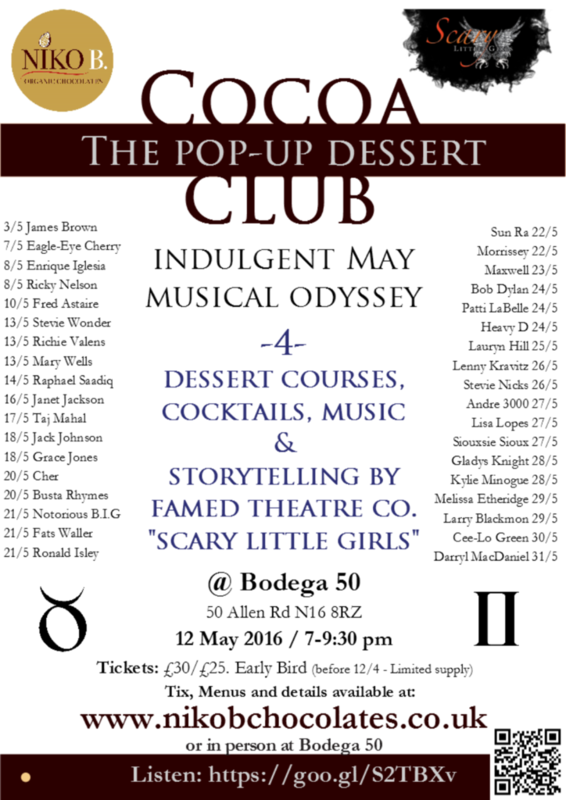 Cocoa Club will take place at Bodega 50 in Stoke Newington, London on Thursday 12th May at 7pm. Get in the mood by enjoying Niko B’s Spotify playlist of classic artists with May birthdays… and book your ticket now – early birds available until 12th April!